Pronounced "scoon," this is the palace where Macbeth was crowned. I'm standing on a hill that's about 10 feet high and 100 x 100 feet. Legend has it that when noblemen came to pay allegiance to the king, they brought a boot-full of dirt from their home turf, and dumped it here. This hill represents 700 years worth of dirty boots. By the way, it's not a castle - apparently, castles are fortified for defense, but palaces are just seats of government - don't go calling it a castle. The palace and grounds are privately owned (! 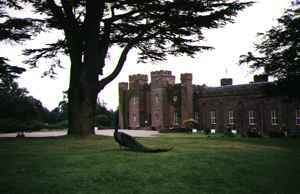 ), and still occupied from time to time by the Earl of... well, probably the Earl of Scone, but I can't remember. I think you know you've "made it" when you've got peacocks wandering around your house.